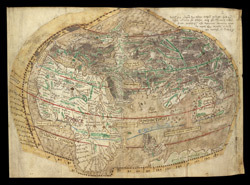 This image of the world dates from circa 1530. The British Isles are included and appear in roughly the right location. England and Scotland are depicted as a curiously elongated shape, with Ireland adjacent. Interestingly, Scotland is not shown as an island, contrasting with other maps of this period where England and Scotland are separated by a tract of sea, sometimes joined by a small knot of land. Above Scotland is a group of multi coloured islands, a yellow label "orchades isule" identifies these as the Orkney islands. The earliest surviving record of the name "Orcdes" appears in the maps by Pomponius Mela, the Roman geographer writing early in the first century AD.